Place a large drain pan under the oil filter B . Remove pins C from the right engine protector located inside right wheel well, remove protector. Remove oil filter B with an oil filter wrench by turning it counterclockwise. Then remove the oil filter by turning it by hand. Be sure to remove any old gasket material remaining on the sealing surface of the engine. Failure to do so could lead to an oil leak and engine damage. 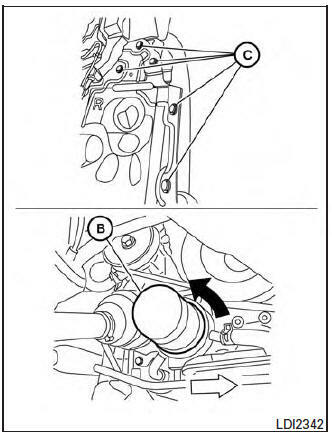 The dipstick must be inserted in place to prevent oil spillage from the dipstick hole when filling the engine with oil.